This article is about the English band. For their 1981 album, see Level 42 (album). For the song by Kaela Kimura, see Level 42 (song). Level 42 are an English band formed on the Isle of Wight in 1979. They had a number of UK and worldwide hits during the 1980s and 1990s. Their most successful single in the UK was "Lessons in Love", which reached number three on the UK Singles Chart, and number 12 on the US Billboard Hot 100 chart, upon its release in 1986. The earlier single, "Something About You", was their most successful single in the United States, reaching number 7 on the Billboard Hot 100 chart. After much success as a live and studio band in the 1980s, Level 42's commercial profile diminished during the early 1990s following a series of personnel changes and musical shifts. After disbanding in 1994, the band reformed in 2001. Mark King and the Gould brothers (Phil and Rowland, the latter generally known by his nickname "Boon") were all brought up on the Isle of Wight and played together in various bands during their teenage years. Phil Gould went on to study at London's Guildhall School of Music and Drama, where he met keyboard player Mike Lindup in a percussion course. Both musicians found that they shared musical heroes: Miles Davis, John McLaughlin, Keith Jarrett and Jan Hammer. By 1979, Phil Gould and Mark King were both based in London and became involved in Robin Scott's pop project M. While working with M, they became acquainted with Afro-French keyboard player Wally Badarou, who played synthesizer on M's US number one single "Pop Muzik". In late 1979, Phil Gould introduced Mark King and Mike Lindup to each other, and all of them began playing together in loose rehearsal sessions, developing their own jazz-funk fusion style. The developing band's original guitarist was Dominic Miller (later to find fame playing with Sting), but he was replaced by Boon Gould on the latter's return from working in the United States. The developing band (at this point, entirely an instrumental act) took the name Level 42 and settled on a working line-up of King (bass guitar, percussion), Lindup (keyboards, percussion), Boon Gould (guitar, saxophone) and Phil Gould (drums). The name of the band is a reference to the novel The Hitchhiker's Guide to the Galaxy by Douglas Adams, in which "42" is the answer to "the ultimate question of life, the universe, and everything." Having maintained their links with Wally Badarou, Phil Gould and Mark King invited him to work with Level 42. Although he never formally joined the band, Badarou would become a fifth member in all but name: co-writing songs, playing keyboards and synthesisers in the studio and co-producing the records. After they were seen jamming together, Level 42 were invited to sign to Elite Records (a small independent label) in 1980. They were also encouraged to branch out into vocal music. Having considered recruiting a singer, the band eventually settled on giving King and Lindup the vocal role. The two men developed a complementary style, with Lindup's falsetto frequently used for harmonies and choruses while King's deep tenor led the verses (although Lindup would also sing entire songs on his own). Lyrics were generally written by the Gould brothers while King, Badarou and Lindup concentrated on Level 42's music. The Elite Records single "Love Meeting Love" brought the band to the attention of Polydor Records, with whom they signed their second recording contract. In 1981, they released their first Polydor single, "Love Games", which became a Top 40 hit. They then cut their critically acclaimed self-titled debut album, which was an immediate success throughout Europe. The band quickly established themselves as concert favourites on the budding British and European jazz-funk scene, taking advantage of the musical expertise and performance skills of all four members. Polydor capitalised on the band's success by releasing a second album, The Early Tapes later in the same year. This was a compilation of material from the Elite Records period (and is also known by an alternate name, Strategy). In 1982, Level 42 released their third album The Pursuit of Accidents. This was a further development of the Level 42 formula, maintaining their instrumental jazz-funk skills and styling but also experimenting further with pop songs. Both of the singles from the album — "Weave Your Spell" and "The Chinese Way" — charted. The latter, in particular, rose high in the charts and gained the band a much wider audience than before. A fourth album, Standing in the Light, was released in 1983. Produced by Larry Dunn and Verdine White (of Earth, Wind & Fire), this album began a new era for the band, being less experimental and less jazzy than previous releases. It provided them with their first UK Top Ten hit, "The Sun Goes Down (Living It Up)". Notably, the album featured no instrumental tracks, with the band now focusing heavily on songs. (The band would not release another instrumental on an album until 1988's Staring at the Sun). The 1984 album True Colours continued the band's development away from straightforward jazz funk, veering stylistically between funk, power pop, mid-tempo rock and moody ballads. It yielded the singles "The Chant Has Begun" and "Hot Water". The latter was a Top 20 hit in Britain and a Top 5 hit in the Netherlands where the band became popular (the song reached also No. 7 in Belgium). During the same year, Mark King released his first solo album Influences on which he played the majority of the instruments (with a guest appearance by Aswad's Drummie Zeb, and with Lindup guesting on additional keyboards). By this time, the band were well established in their mainstream pop/R'n'B sound, as evidenced on their next studio album, World Machine, released later in 1985. King's dextrous bass playing and Lindup and Badarou's chugging keyboards acted as templates for pop songs such as "Something About You" and "Leaving Me Now", which were both UK Top 20 hits (Top 40 hits in the Netherlands). Significantly, "Something About You" was also their first (and only) US Top 10 the following year; also reaching the Top 5 in Canada and the Top 20 in Italy and New Zealand. "Leaving Me Now" was the second hit from this album, peaking at No. 15 in the United Kingdom but proving less successful in Europe. Elements of Level 42's roots could still be found in the funky "Coup d'État" and "Dream Crazy" on the UK version of the album, as well as a long instrumental track named "Hell," which was also recorded during the World Machine sessions (This last track did not see the light of day until the early 2000s as an MP3 download on the original Napster). World Machine gained positive reviews from critics, with AllMusic journalist William Cooper, in a retrospective review, describing it as "one of the finest pop albums of the mid-'80s." During the recording of the album, the first major tensions between Phil Gould and Mark King began to surface over musical direction, production and their personal relationship. This clashing led to Gould leaving the band for a week. Allan Holdsworth's drummer Gary Husband was lined up as a potential replacement, but Gould and King's dispute was subsequently patched up and the group went on to enjoy their most successful year to date. Released in early 1986 (and initially recorded to keep up the band's European chart momentum while the band was busy touring the United States), "Lessons in Love" was an international hit and became Level 42's biggest selling single. It gave the band their first number one in Denmark, Germany, Switzerland and South Africa, increasing the band's popularity considerably. It also placed at No. 2 in Italy, the Netherlands and Sweden, No. 3 in the UK and in Ireland, No. 4 in Austria, No. 10 in Norway, No. 12 in the US in 1987, No. 18 in New Zealand and No. 22 in France). "Lessons in Love" became the lead single on 1987's Running in the Family album, recorded to capitalise on the impact. With the band now at the peak of their success, the album added further gloss to Level 42's polished pop sound (despite adding to Phil Gould's disquiet). Further singles from the album continued and built on the band's existing profile: "To Be With You Again" (No. 6 in the Netherlands and in Ireland), the ballad "It's Over" (No. 3 in Ireland and No. 7 in the Netherlands) and Running In The Family's title track (No. 1 in Denmark, No. 3 in the Netherlands, No. 4 in Ireland, No. 5 in Switzerland, No. 7 in Norway and No. 9 in New Zealand). The album itself was a major international success, reaching the Top 10 in numerous countries,. By now a leading British pop band, Level 42 played at the Prince's Trust concert in June 1987, with Eric Clapton standing in on lead guitar for a performance of "Running in the Family". King and Lindup also performed with artists including Ben E. King on "Stand By Me" and George Harrison and Ringo Starr on "While My Guitar Gently Weeps". Despite the success, Level 42 were on the brink of splitting up. Although Phil Gould was the most visibly dissatisfied member, it was Boon Gould who was the first to leave, departing in late 1987, following a support slot on a Madonna tour. The quietest member of the band, Boon's departure came as a surprise to King and Lindup. however, he had been suffering from nervous exhaustion and also wanted to leave the lifestyle of a constantly touring musician in order to settle down and spend more time with his wife and children. Boon's relationship with the band remained amicable and, although he would not return to Level 42 as a performing or recording member, he continued to write lyrics for the band following his departure. He was temporarily replaced by Paul Gendler (an experienced session player who had previously been the guitarist for Modern Romance) for a six-week headlining tour and for further support slots with Tina Turner. In December 1987, midway through the tour, Phil Gould finally left Level 42 permanently. Like his brother, he was suffering from exhaustion, but his relationship with King had broken down once again and they now found it difficult to work together. Phil was also reportedly dissatisfied with the band's direction in terms of their newer "pop" sound, and King and Lindup failed to convince him to stay. To complete the tour dates, the band hired Prefab Sprout drummer Neil Conti to fill in. Following the tour, Level 42 recruited Gary Husband as the band's new full-time drummer. He in turn recommended Steve Topping as a replacement guitarist. However, Topping and King's personalities clashed and Topping eventually left the band in early 1988 after initial writing and rehearsing sessions in Dublin. Most of the next Level 42 album, Staring at the Sun, was recorded without a permanent guitarist. Rhythm guitar on the studio recordings was handled either by the band's old friend Dominic Miller or by an uncredited Mark King. In April 1988, towards the end of the sessions, the band recruited lead guitarist Alan Murphy (a session guitarist who had worked extensively with Kate Bush and had also been a member of Go West). Staring at the Sun was released in 1988, reaching number 2 in the UK and the top ten in several European charts. It included the hit-single "Heaven in My Hands" (number 12 in the UK and also top twenty in the Netherlands, Norway, Switzerland). Boon Gould had co-written many of the tracks with King, Lindup and Badarou, while Gary Husband was credited with his first co-write with King on "Tracie" (a tribute to King's childhood sweetheart). To promote the album, Level 42 embarked on a four-month European tour, culminating in six sell-out nights at Wembley Arena. These latter dates were recorded for what would become the band's second live album, Live At Wembley (eventually released in 1996). Although the band seemed to have maintained their momentum and recovered well from the split of the original lineup, they were about to be hit by a serious tragedy. Unknown to the rest of Level 42, guitarist Alan Murphy was suffering from AIDS, something which he himself may have been aware of before joining the band. At the time, his previous band Go West had been stalled by internal disagreements, and one of Murphy's reasons for joining Level 42 was to ensure that he spent his last days playing the music that he loved. During 1989, Murphy contracted pneumonia: weakened by his existing condition, his decline was rapid and he died on 19 October 1989. Devastated, Level 42 took a year off to regroup and rethink. To cover the gap and to fulfil the band's contract with Polydor Records, Level Best (a greatest hits compilation) was released at the end of 1989; also marking a decade since the band's beginnings. During the break, Mike Lindup also recorded and released his debut solo album, Changes (featuring Dominic Miller, Pino Palladino on bass and Manu Katché on drums). The band signed a new contract with RCA Records in 1990, for whom they produced their next album, Guaranteed. Although most of the rhythm guitar work was once again handled by Dominic Miller, Gary Husband asked Allan Holdsworth to provide some guitar work (notably on "A Kinder Eye"). As well as drumming, Husband also played keyboards and increased his songwriting role, co-writing many tracks with King, Lindup and Badarou. The album features the only track entirely written by Husband – "If You Were Mine" – which also featured on the "Guaranteed" single release. Mark King also collaborated with lyricists Drew Barfield and George Green to expand the songwriting. Guaranteed was well received by American music critics. However, the album did not get good reviews in the UK (despite reaching No. 3 in the UK charts while the title track reached No. 17 in the singles charts) and was ultimately less commercially successful than previous efforts. In December 1990, Level 42 returned to play a record run of concerts at Hammersmith Odeon, London, in part fulfilling booking obligations preceding the band's recent hiatus. The concerts featured Allan Holdsworth (whom Husband had asked to play as a favour while the band searched for a permanent guitarist) plus four additional players: Lyndon Connah (ex-64 Spoons) on additional keyboards and percussion and sharing backing vocals with Annie McCaig, plus the horn section from the Guaranteed album (John Thirkell and Gary Barnacle). After the recording of Guaranteed and a week-long promotional tour, Level 42 were in need of a permanent guitarist. Mark King assumed (erroneously) that Allan Holdsworth would not be interested in taking the position. Instead the band recruited well-respected art-pop guitarist, session player and sometime solo artist Jakko Jakszyk: the former frontman for 64 Spoons, he'd also collaborated with Tom Robinson, Sam Brown and Stewart/Gaskin among others. Although he did not play on Guaranteed, Jakszyk appeared on the album's cover photo and took part in promotional duties and the tour for the album, as well as playing on two B-sides from this era ("At This Great Distance" and "As Years Go By"). Unlike Husband, Jakszyk never became a full legal member of the band (apparently due to "record company politics"). However, following the end of promotion for Guaranteed, the King-Lindup-Husband-Jakszyk line began writing and recording new material together, with at least two songs ("Fire" and "Free Your Soul") completed. Following the next development in the band's history, this work was shelved and remains unreleased. In early 1993, Gary Husband left Level 42, leading to the return of group founder member Phil Gould as Level 42's drummer (and principal lyricist) for 1994's Forever Now album. Further changes to the band were evident in that Jakko Jakszyk did not play on the album: all guitars were performed by the American session guitarist Danny Blume (erroneously credited as "Danny Bloom"). Although Forever Now was a critical success, the reunion of Gould and the group was short-lived. When Level 42 began to promote the new album (with Jakszyk returning to the live band for concerts and TV appearances), Gould played only one promotional gig and did not go on the road for the Forever Now tour. He was replaced as live drummer by Jaksyk's friend and frequent collaborator Gavin Harrison (who later played drums for both Porcupine Tree and King Crimson). It was announced halfway through the Forever Now tour, on the day of the Manchester Apollo gig, that the band would be disbanding permanently following their concert commitments. Level 42 played their last gig at the Albert Hall in London on 14 October 1994. According to Jakszk, the band recorded tapes for a live album during the final 1994 shows at the Albert Hall and the Brighton Dome which "sounded fantastic", but the album was never released. In 1996, Mark King signed to Virgin Records and released a solo single "Bitter Moon" (with Lyndon Connah playing keyboards). This was followed up by his second solo album One Man, featuring lyrics by Boon Gould. The album was not a big commercial success. King later toured as a solo act, playing his own new compositions and some Level 42 favourites. In 1999, he played some shows at the Jazz Cafe in London under the name of "The Mark King Group" with a band including Husband, Jakszyk and Connah and Jakszyk's fellow former 64 Spoons colleague Lyndon Connah on keyboards. Jakszyk left the band after the Jazz Cafe shows, to be replaced on guitar by Nathan King (Mark King's younger brother). King continued to tour with this band, now renamed "Grupo Mark King", over the next couple of years, augmenting the line-up with saxophone player Sean Freeman. 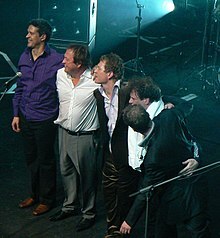 In August 1999, three-quarters of the original Level 42 line-up reunited for a private show. Phil Gould invited some musician friends to play at a party, including his brother Boon and Mike Lindup. In 2001, Mark King, Mike Lindup and Phil Gould played together at Lindup's wedding for the first time in ten years. Although Mark King was by now two albums into a solo career, his previous band's music proved to be persistently popular and he found that he was playing more and more old Level 42 tracks at live shows. In late 2001, King came to a business agreement with Mike Lindup and bought the rights to the name Level 42. Although Lindup agreed to play on future albums, he did not want to tour. King announced the return of Level 42 with a new line-up which also happened to be the musicians from his current live band: himself, Husband, Connah, Freeman and Nathan King. On 12 July 2002, the first official Level 42 concert for six years was played at The Circus Tavern in Purfleet, Essex. While not recording any new material, for the next few years the band settled into a regular pattern of touring and playing old hits. On 13 February 2005 there was a brief one-night reunion with Mike Lindup (who joined the band onstage for a date at The Forum in London) and over the course of the year there was a burst of reissue activity. Two Rockpalast shows from 1983 and 1984 were released on DVD, followed by two CD releases: The River Sessions (a live show from 1983 recorded in Scotland) and a new compilation called The Ultimate Collection II. The latter included a new song called "Genius Of Love", which was a Level 42 tribute/collaboration by the Italian-American dance producer Hardage, featuring Mark King on vocals and incorporating a sample of the Level 42 track "I Want Eyes". In February 2006, after twelve years without releasing a new studio album, Level 42 announced the release of Retroglide. While billed as a band album, it was chiefly recorded and produced by King at his home studio, with Gary Husband, Lyndon Connah, Sean Freeman and Nathan King all contributing. Retroglide also featured input from two previous Level 42 members. Erstwhile guitarist Boon Gould provided the album's lyrics (as well as contributing a guitar solo on "Ship") and the band was effectively expanded to a six-piece via extensive guest performances by Mike Lindup, who added prominent keyboard parts and vocals to many tracks. Although Phil Gould was uncredited on the album, the track "Ship" is the first song since 1986 worked on by all four original members, as Phil originally arranged the track with his brother Boon. However, Retroglide was also the first Level 42 album not to feature any contributions from Wally Badarou. In May 2006, Level 42 announced that Mike Lindup would return full-time to replace Lyndon Connah on keyboards. Retroglide was promoted via a supporting tour throughout the UK, Netherlands, Germany and several other European countries during October 2006. On 26 August 2007, Level 42 played an outdoor gig at the Arundel Festival in West Sussex: the band's only UK show of the year. In 2008, Level 42 played a twenty-date UK tour. In 2010, Husband stepped down as Level 42's drummer for the second time, due to prior commitments with John McLaughlin. Husband was replaced by Pete Ray Biggin. In 2012, Level 42 toured the UK and mainland Europe, in celebration of the 25th anniversary since the release of Running In The Family, by playing the whole album, with a whole array of other hits. Also included in the shows was an acoustic set, with Mike Lindup playing the accordion. In October 2012, on Mark King's birthday during a gig in Bristol, Boon Gould joined the band on stage. On 20 and 21 September 2013, Level 42 (joined by an expanded brass section), performed three new songs at London's Indigo O2 Arena - "Where's Yo' Head At", "Too Much Time", and "Sirens". All of these appeared on the band's first new release for seven years, the six-song studio EP "Sirens" (released on 31 October 2013, and the first output from the band's new self-owned label Level 42 Records). Mixed by the American DJ John Morales, the EP also contained "Mind On You", "My Independence Day" and "Build Myself a Rocket" (with King's daughter Marlee providing the backing vocals on the last of these tracks). Musically, it built on the production approach of Retroglide while allying the band with contemporary developments in R&B and dance electronica. On 3 December 2013, the band announced 'The Sirens Tour' - a 30 date tour, starting in October 2014 and taking in the UK, Netherlands, Germany and Italy. In the summer of 2014, the band performed at a number of festivals across Europe including headline performances at Let's Rock Bristol and Rochester Castle. They also played at Rewind festivals. At a performance in Bournemouth, ex-drummer Gary Husband returned due to Pete Ray Biggin being unavailable. In 2015, the band appeared at a number of UK and European festivals headlining at 'Let's Rock The Moor' and 'Carfest' concerts. They also played two nights at the Indigo2 in London where the band once again featured a larger brass section consisting of Dan Carpenter (trumpet) and Nicol Thomson (trombone) as well as regular saxophonist Sean Freeman. In 2016, Level 42 performed at a number of festivals across the UK and Europe as well as in Curaçao, Chile and Argentina before embarking on a UK, Netherlands and Scandinavian tour in order to promote the "Sirens II" EP. ^ a b c Erlewine, Stephen Thomas. "Level 42 – Artist Biography". AllMusic. All Media Network. Retrieved 27 April 2016. ^ a b Metzer, Greg (2008). Rock Band Name Origins: The Stories of 240 Groups and Performers. McFarland. p. 114. ISBN 978-0-7864-5531-7. ^ a b Jisi, Chris (1 August 2010). "Royal Return: Mark King Leads Level 42 On Its 30th Anniversary Comeback". Archived from the original on 3 February 2014. Retrieved 22 May 2013. CS1 maint: BOT: original-url status unknown (link). Guitar Player. ^ Inskeep, Thomas; Soto, Alfred. "The Bluffer's Guide – Sophisti-Pop". Stylus. Retrieved 29 April 2016. ^ "Interview: Mark King - Level 42". level42.com. Retrieved 18 September 2014. ^ Cooper, William. "World Machine - Level 42 : Songs, Reviews, Credits, Awards". AllMusic. Retrieved 14 September 2012. ^ Hung, Steffen. "Level 42 - Lessons In Love". lescharts.com. Retrieved 30 December 2011. ^ Hung, Steffen. "Level 42 - Running In The Family". charts.org.nz. Retrieved 30 December 2011. ^ "Level 42 in Princess Trust's concert 1987". Level 42 Web Digest. Retrieved 2 May 2008. ^ "Level 42 Band Members @". Forevernow.com. Retrieved 15 October 2013. ^ "Alan Murphy's Profile". Forever Now.com. Retrieved 2 May 2008. ^ Murphy, Alan. "Alan Murphy's Blog | UK Property Market". Alan-murphy.co.uk. Retrieved 15 October 2013. ^ "Unreleased Tracks". Forever Now.com. Retrieved 2 May 2008. ^ "livenation". New Tour. Retrieved 30 May 2007.